While Ogden may be best known for its deep, light powder snow and downhill skiing, outdoor recreation off the ski hill abounds in the Ogden Valley. 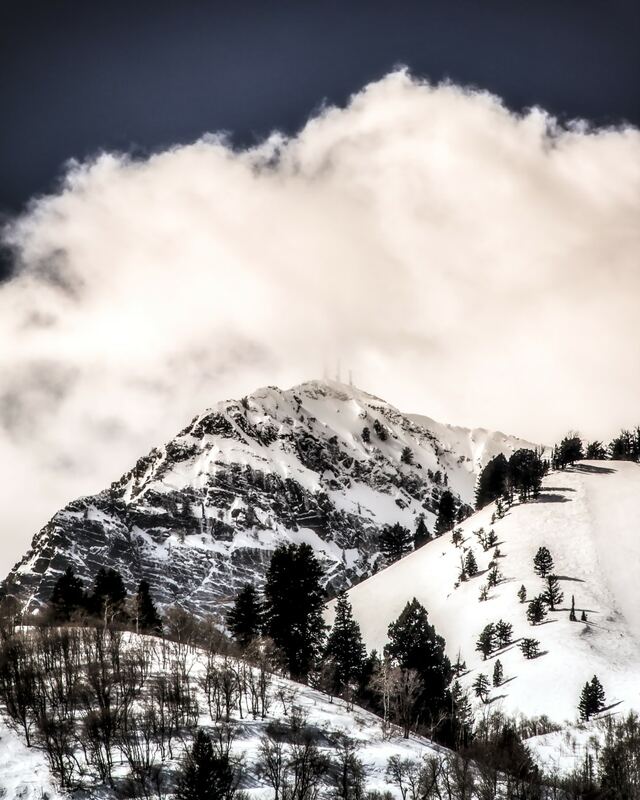 The Ogden Valley is a mountain-lover’s paradise nestled in the Wasatch Range north of Salt Lake City. If you’re looking for adventure off the ski hill, you don’t have to drive far to find it in Ogden. Whether you’re looking for a long trek through the forest on snowshoes or ice skating with the Wasatch Mountains in the distance, you’ll find beauty and adventure around every corner. Here’s how to enjoy your winter time in Ogden away from the slopes. Along with northern Utah’s famed resort skiing, the Ogden Valley boasts some of the best Nordic skiing tracks in the state. For those who love spending time on skinny skis, these trails are sure to impress. This cross-country skiing park offers 20 kilometers of groomed tracks right at the base of the stunning Wasatch Mountains. With gear rentals available on weekends at the Ogden Nordic Center, you can enjoy this winter wonderland without lugging any of your own gear on your vacation. North Fork is also a designated dark sky park, which means well-prepared visitors on clear nights can expect pristine skies for stargazing. The groomed Nordic tracks at Snowbasin Resort offer the perfect opportunity for adventure. Enjoy cross-country skiing, snowshoeing, or even fat biking along the designated trails at the ski resort. After a day of winter fun, head to the Cinnabar Lounge in Earl’s Lodge for tasty appetizers and live music. Considered by many as going for a hike on top of the snow, snowshoeing is a fun way to get on your favorite trails even when they’re covered in white powder. Here are a couple local favorites in the valley. Catch some of the best snow-covered scenery in the Ogden Valley by snowshoeing the 4.5-mile Wheeler Creek Loop to Ice Box Canyon. The Wheeler Creek Trail is one of the most popular in the Ogden area, and for good reason: This trail parallels Wheeler Creek while weaving through pine, aspen, and craggy cliffs before giving way to wider views of the surrounding mountains. Located on the other side of the valley towards Snowbasin Resort, the Green Pond Trail is a hidden gem with fewer crowds and scenic vistas to make the solitude that much sweeter. For ambitious snowshoers, continue up the trail to reach the Strawberry Gondola Station at Snowbasin Resort, where you can meet the skiers in your group for a hot drink and a bite to eat before returning to the solitude of the snowshoe trail. Fun for the whole family, the options for ice skating in the Ogden Valley offer breathtaking views or a convenient location near downtown. Ice skaters with an adventurous side and their own skates should head to Pineview Reservoir for a truly unique experience. Enjoy the peace and quiet while skating amongst the beauty of the Wasatch Mountains. For a more traditional ice-skating experience, the Weber County Ice Sheet offers open skating with rentals for both figure skating and hockey. Take a lesson to learn the basics, or just enjoy open skating time with family and friends. The Weber County Ice Sheet is conveniently located just south of downtown Ogden, so you don’t have to go far to enjoy the fun. If you’re visiting the Ogden Valley for its reputation as a winter wonderland, here are a few tips to maximize your trip. For snowshoeing and Nordic skiing adventures, the best snow tends to fall in January and February. In those mid-winter months you’re sure to find an abundance of snow-covered trails. For those planning to cross-country ski at North Fork Park and will rely on rental gear, keep in mind that the Ogden Nordic Center is only open on weekends from Friday-Sunday. If you want to go on weekdays, be sure to have your own gear or rent ahead of time for a great experience. If you’re hoping to get the most out of the holiday festivities, just after Thanksgiving marks the opening of Christmas Village along Washington Boulevard and the Electric Light Parade. Whether you’re looking for a bite to eat or a downtown adventure, Ogden’s Historic 25th Street has it all. Head to Roosters Brewing for a cold beer and some upscale pub grub or Tona Sushi Bar and Grill to get a taste of the best sushi in Ogden. Written by Stasia Callaghan for RootsRated Media in partnership with Utah Office of Tourism.